Guests may now choose Magdalena’s “Grand Experience” All-Inclusive Plan which was designed for those who seek the ease and convenience of all-inclusive dining including in-room menu options. This new option includes your accommodation in an oceanfront room or suite, four Tobago dining options, unlimited non-alcoholic beverages and unlimited house-branded domestic and international spirits, house wines and domestic beers, plus all taxes and service charges. You can enjoy all this and not wonder what the cost will be at check-out. 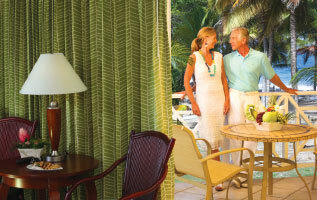 Your accommodation as booked in an oceanfront room or suite, inclusive of all government taxes and service charge. Participation in our daily Tobago activities program and complimentary shuttle service to Pigeon Point Heritage Park (does not include entry fee). Use of our fitness club and saunas for both ladies and gentlemen, lighted tennis courts, and bicycles. Use of three swimming pools (one adults only), beach loungers, and beach towels. 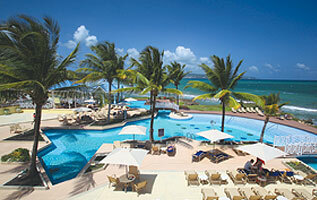 Discounted golf green fees at the Tobago Plantations course managed by Magdalena Grand Beach and Golf Resort. Club Cee Cee Kid’s Club for children accompanied by registered guests. * Participation in our daily activities programme. Breakfast daily from our famous breakfast buffet at Pembois Restaurant and Terrace or a Magdalena Grand continental breakfast from in-room dining*. 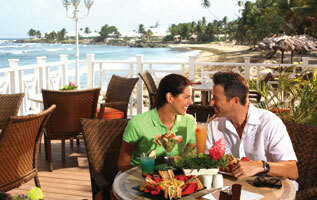 A lá carte lunch at Salaka Grill or a casual BBQ Lunch at Pembois Restaurant and Terrace. Afternoon tea served on request. A choice of four dining options: Pembois Restaurant and Terrace featuring an international buffet; a la carte dining at the oceanfront Salaka Grill (weather permitting); intimate dining at Kali’na, our upscale Caribbean fusion restaurant from the Grand Experience menu; or casual dining at the English style Robinson Crusoe Pub. In-room dining is also available from the Room Service Menu *. Sunday Brunch and other special dining options available to house guests and the public at Pembois Restaurant and Terrace. Unlimited non-alcoholic beverages in all outlets. Unlimited house brand domestic and international alcoholic beverages, house wines by the glass, domestic beers, and cocktails as outlined in the all-inclusive selection of wines and spirits in all bars and restaurants. Value added tax and service charges. *A delivery charge will be added to all room service or in-room dining orders and charged to your guest folio for payment at check-out (For verification and as a record of consumption you will be asked to sign a guest check at each service. Please sign your account to your room: no charge will be made to your guest folio for included items). Premium food items from the Salaka’s dinner menu. Golf Beverage Cart purchases and food and beverage purchases at the Fairways Bar and Grill. Bottled wine and champagne and other premium branded beverages not included in the All-Inclusive selection of wines and spirits. Golf green fees, rentals and instruction. Diving and dive instruction (unless offered as part of the posted Daily Activities Program). Tours and Excursions (except daily shuttle service to Pigeon Point Heritage Park). Entrance fee to Pigeon Point Heritage Park. Off-menu items such as birthday cakes, amenities, decorations, private meal service, and banqueting services. All other incidental charges unless specifically included. **A food credit will be offered to patrons wishing to dine from the full a la carte menu. ***A 20% discount or reduction in pricing is offered for these items.